De-topping is one of the unique operations in cultivation of onion crop and it is tedious, laborious and time consuming operation demanding huge labour to the extent of 12.5 man-hrs/t. 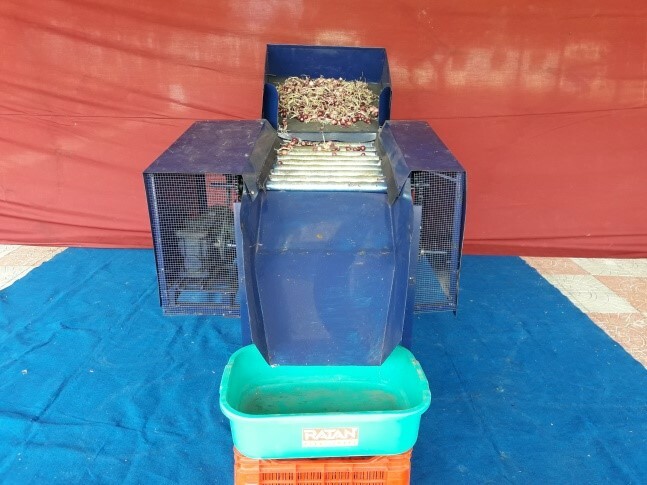 This power operated onion de-topper consists of a feed conveyor for feeding cured onion crop, de-topping rollers for shearing the leaves, separate collection chutes for the de-topped onion bulbs and leaves, main frame, power and power transmission system. The onion detopper was powered by a three phase, 2 hp, 900 rpm electrical motor with necessary speed reduction gear box. The performance parameters of onion de-topper were found to be 98 % de-topping efficiency, 0.98 effectiveness of de-topping, 2 % damage and 300 kg/h capacity at 200rpm with the machinery costing about Rs.1,50,000/- per unit.